i bet you can guess what the update will be this week! they’ll be up in the hat shop today. and there will be no update next week as i get ready for Handmade Arcade and BazBiz Cleveland (i’ll be there the second day only). but you can expect one the following wednesday with all of the last minute hats and yarns that i made for these shows. 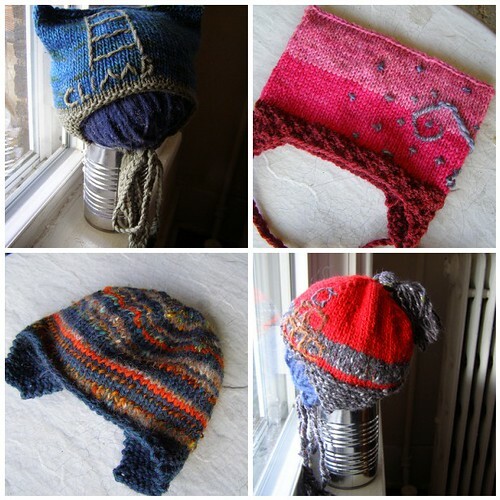 This entry was posted in cosyknitsliterally, hats, knitting, update by cosymakes. Bookmark the permalink. good luck at your show!! may you sell many warm woolies. Hey Cosy! Saw “The Road” this weekend, and kept nudging my husband – I know the girl who knit that sweater! I know the girl who knit that hat! I think I was driving him nuts at the end, but it was so cool to look at something handknit in a movie and know that I “know” the person who did it!! Kudos! hahaha :) awesome. we need to go see it still.